Put the orange juice and zest and honey into a small pot. Simmer and reduce till it’s syrupy. Watch it carefully otherwise it may reduce too much. Add the butter and liqueur. Once the butter has melted remove from the heat. Cut the rosemary stalks into roughly even lengths. Pull off most of the leaves. Thread two half pieces of fruit onto each stalk. Place these all in shallow dish and pour over most of the syrup. Heat a grill pan or barbecue. 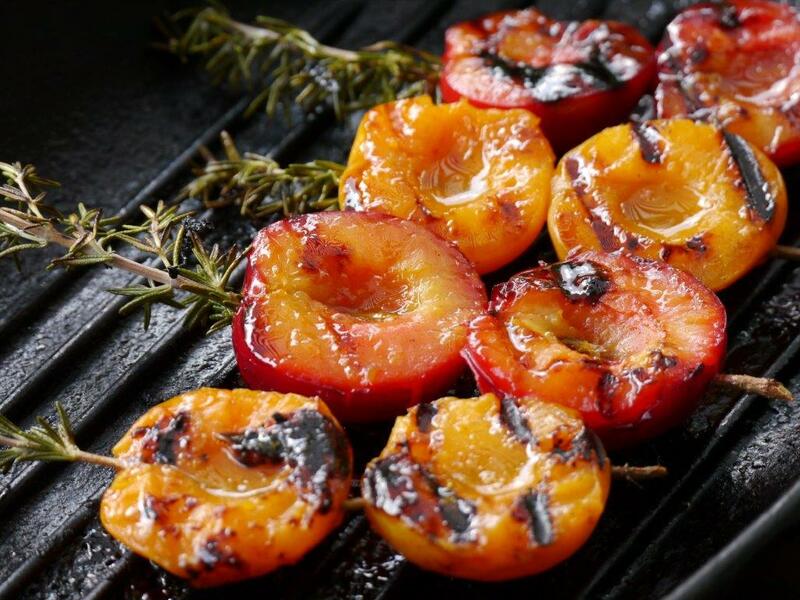 Place the rosemary fruit skewers on the grill cut side down. Leave for a minute or two. Turn the skewers over and pour over some more syrup. Cook for another minute or until the fruit is starting to soften but isn’t mushy. Once ready the fruit will be infused with a gentle rosemary flavour. Serve warm or at room temperature with plain yoghurt or cream or the following frozen yoghurt. If you have any syrup left offer that on the side.